Nia has a dream about Agent Liberty she refuses to believe is a vision of the future. Brainiac-5 tries to help her embrace her gift after Kara realizes there is something wrong with her protege. Meanwhile, Manchester Black confronts Ben Lockwood over his ties to the Children of Liberty. Given that tracking dogs are trained to sense specific scents, how can an alien-sniffing dog be trained to track a Kryptonian when there are only two of them on Earth? How the heck does Ben Lockwood know that Supergirl has a secret identity. For that matter, how does he have any credibility on this point with anyone other than crazed conspiracy theorists, much less have the pull to get The President to demand Supergirl reveal her secret identity? How is Manchester sent to prison and put in a uniform faster than Ben Lockwood, despite being arrested at roughly the same time? The movie Nia is watching in her dream as the episode opens is North by Northwest. Nia confesses that she is an alien from the planet Naltor. In the DC Comics Universe, many natives of the planet Naltor possess precognitive powers. Depending upon the continuity, their visions of the future may only come to them in dreams or may come to them when they are awake. According to Nia, once in a generation, some women of the Arrowverse version of Naltor gain the power to see the future. She cannot control what she sees and often doesn't know what she is looking at. Brainiac-5 accidentally calls Nia by the name Nura. This is a reference to Nura Nal - the Legionnaire known as Dream Girl. In the comics, Nura Nal was a precognitive member of the Legion of Super Heroes. It was revealed in the press for the new season that in the Arrowverse, Nura Nal exists in Brainiac-5's time and Nia Nal is her ancestor. Brainiac says that there is a little bit of Nth Metal in his ring. One of the many powers conferred to all Legion members through their rings is the power to fly - a property granted by objects made of Nth Metal. The final scene of the episode is set on Earth-90 and is revealed to be the world of the 1990 The Flash TV series. It seems likely it was named Earth 90 in honor of the year 1990. The music sting that is heard as The Flash runs towards the camera is The Flash theme from that TV series. Brainiac-5 says that in his time, the symbolism of dreams pioneered by Jung and Freud is now called Frungian. Nth Metal is the strongest metal in existence. There is a bit of it in every Legion flight ring. Manchester attacks Supergirl with a bomb full of dust from an alien moon. The dust fragments are sharp enough to cut Kryptonian DNA, honest to a nanometer. Manchester figured that Supergirl's insides were probably softer than her outside, so getting her to inhale a lungful of particles should slow her down. J'onn: I am still so sorry about what happened. I led you right into his trap. Kara: You're apologizing to me for believing the best in someone? Kind of my whole thing. Lydia: I think it's very thoughtful of you to come all the way here in person to thank him. Manchester: Well, how could I not after what he did? Manchester: I'm talking about the gift, man. Ben: (as if remembering) The gift! Of course. The gift. Manchester: The wedding gift. Great big set of steak knives for me and my fiancee. Fiona? Manchester: You all right there, Benjamin? Ben: You know, that's from Bunker Hill? Remember that one? The one where The Brits thought they had won, but the battle ended up so bloody that it cost them the war and it wasn't worth it? J'onn: Manchester. Tell me where you are. Manchester: (smacking himself in the side of the face) Get out of my head! J'onn: You made a promise. Manchester: That promise died with Fiona. J'onn: But it didn't die with me! If you can't hold yourself to that promise, I will. J'onn: I feel your pain, Manchester. Give this up! Manchester (panting): You want to feel my pain? (starts cutting his hand with the bayonet blade) Feel it! 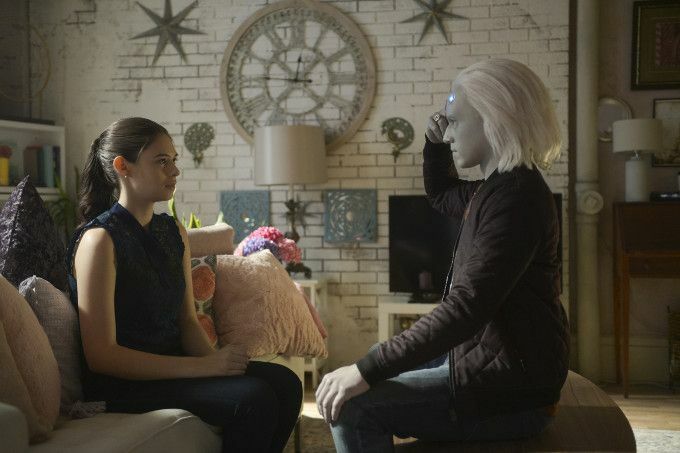 Brainy: It's going to be alright. Nia: Alright?! We've been kidnapped! Kara: Reporting 101 - If you get kidnapped, you're on the right track. Nia: That doesn't make any sense! Kara: Tell that to Lois Lane. Nia: I thought that was a class ring? Supergirl: If you kill him.... what does that make you? Manchester: (holding up his coat like he was curtsying, mockingly) The Intolerant Left. Supergirl: (gasping) If we want to win this... we have to be better. Let me take him to prison. Show people who he really is! Manchester: Don't be daft! Those people hate you! You can put a cape on, say you're a superhero, but to him and everyone else like him you'll only ever be an alien! (draws out some kind of energy weapon) A roach! Manchester: Time to pick a side, Pollyanna. You're with them? Government stooge? Happy Meal Hero? Or you're with me. And we string up the lot. Every terrorist turning your streets into war zones. You keep saying it's a never-ending battle. How about you and I end it together? Supergirl: I'll never be like you. Lydia: Ben, don't! Ben, put the gun down! Ben: That's Nth Metal. Supergirl! No point struggling! Supergirl: (growling) I'm not struggling! I'm flying! President Baker: I hope you will comply. The United States does not want a war with Supergirl. Supergirl: Then I trust you won't start one. Nia has a roommate, who she asked not to let her sleep. J'onn says he saw no light left inside of Manchester when he last touched his mind. Manchester Black's brass knuckles have a Union Jack engraved on the base. One of the Children of Liberty captured on Shelley Island is a man named Frank whose background has been erased. Brainiac-5 has begun studying the classic films of Earth. He can discuss auteur theory, has seen Spartacus and is quite fond of Ed Wood. Brainiac-5 knew who Nia Nal was from the the 31s Century but he refuses to tell Kara or Alex why because it could have a devastating effect on the space-time continuum. All Brainiac-5 will say is that Nia might be able to help the DEO find Agent Liberty. He does seem disturbed that Kara let it go when Nia said she had a nightmare about Agent Liberty. The President's approval numbers went down after the Children of Liberty on Shelley Island were captured. Ben Lockwood speaks to someone he calls Thack about their war being multi-front and putting Agent Liberty on hold for a while and letting him and his new TV show take priority in trying to shift more moderate people towards their cause. Ben Lockwood's show is on Tuesdays at 5 PM. Manchester Black introduces himself to Ben Lockwood's family as a friend from the university. J'onn tries to use Manchester's brass knuckles to locate Manchester. Nia tells Kara that her family is from the planet Naltor. Nia says she had a dream of Agent Liberty killing a woman. Brainiac-5 tells Nia that her visions are of probable futures - not set events. He later says that the things she sees are sometimes more symbolic than literal - what 21st century psychologists would call Jungian or Freudian imagery. Brainiac-5 accidentally calls Nia Nura. Nia sees a hook in her nightmare. She is able to slow down the vibrating image of the woman crying for help, begging for her life, asking the person to put the gun down. She is wearing a hoodie for the Collinwood 5K. She then sees Agent Liberty drawing a gun. There is also quick flash of a man in a long coat holding a long weapon on the woman as well. Ben Lockwood's great-great-great-grandfather was a blacksmith. He has a bayonet blade that his ancestor forged on display in his home, which was used at the Battle of Bunker Hill. J'onn is shown to be capable of telepathically controlling a person when he has an object to focus on. However, this connection can be broken by intense pain, as Manchester cuts himself to force J'onn out of his head. Brainiac-5 says that Colinwood was an early center for anti-alien activity. Brainiac-5 apparently considers the original The Purge to be a classic movie. Kara spots two men with guns and a woman with a Child of Liberty mask in her purse following her, Nia and Brainy with an alien-sniffing dog. Nia's has a narcoleptic fit that gives her a vision of the Children of Liberty trying to shoot her seconds before it happens. She is able to duck in time and raise her hands so her shackle chain is broken by the bullet. This is the first time her powers worked on a reflexively level. Ben Lockwood is forced to show his wife where he hides his Agent of Liberty costume and confesses to having killed because of what he has done. Kara discovers that the building she, Brainy and Nia were taken is a Lockwood Family Steel building. Alex tricks Frank into outing Ben Lockwood as Agent Liberty by pretending they already caught the real Agent Liberty. J'onn tries to stop Manchester one more time, but Manchester tells him the only way to stop him is to kill him. J'onn relents when he realizes that is true. Manchester chases Agent Liberty to the Nth Metal Foundry near the Lockwood Family Steel Mill. Supergirl goes to the Lockwood home and discovers the bayonet in the basement. Nia has another vision. This time she sees the woman is holding a gun on a man in a long coat who is holding some kind of long weapon. The man in the long coat is revealed to be Manchester Black. The woman is revealed to be Lydia Lockwood. Nia is able to knock Manchester out using a hook in the factory's equipment. Both Manchester Black and Ben Lockwood are arrested. J'onn visits Manchester in prison and tells him he thinks he can still be saved. Supergirl is fired from the DEO after she refuses to reveal her secret identity. A mob of supporters masses outside the prison where Ben Lockwood was arrested. Lydia Lockwood is at the front of the mob, and begins a chant of "Liberty!" when Supergirl shows up to watch Ben Lockwood being put in jail. The final scene reveals that Earth 90 is the Earth of The Flash TV series from 1990. An effective mid-season finale that brings most of the subplots to an effective stopping place while setting up a few mysteries to propel things forward. And the final scene to lead into Elseworlds sent my inner 12 year old screaming with excitement.